Modern drug discovery and development is truly an interdisciplinary science, that has benefitted on the one hand from the growing body of knowledge about the molecular basis of diseases and, on the other hand, from the fascinating new technologies which enable scientists to carry out the discovery phase with efficiency and cost effectiveness. Being an important translational science which addresses key human needs, the key emphasis has been on reducing the time from laboratory bench to clinical use. Global literature in the field of drug discovery and development is spread over journals and monographs of many disciplines, and it is often difficult for practitioners to keep pace with the most recent advances in the disciplines. 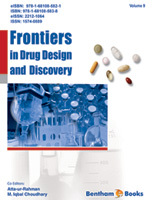 The key goal of the book series Frontiers in Drug Design and Development is to provide updated information about important developments in this fast-moving field that will assist the practitioners to have better understanding of the recent advances. The 9th volume of Frontiers in Drug Design and Discovery is a collection of seven scholarly written reviews, contributed by leading experts in the fields. Each review addresses an interesting aspect of drug discovery, drug delivery, and drug target identification in the broad areas of cancer, infections, and inflammatory diseases. Kontos et al. have contributed a comprehensive review on the current understanding of various prognostic biomarkers of prostate cancer (CaP), including prostate-specific antigen (PSA). CaP is the most common cancer in men, and the second leading cause of death due to cancer in men globally. Early diagnosis of CaP is critically important to achieve therapeutic success. CaP is currently diagnosed through elevated levels of PSA and digital rectal examination followed by prostate biopsy. Prognostic biomarkers can play an important role in early diagnosis of the disease and in the selection of patients for specific treatment. PSA has served as a widely used biomarker of CaP and it has played an important role in lowering the mortality rate due to prostate cancer. However, PSA levels are now recognized as less than an ideal indicator of the disease state and over-diagnosis of CaP has been reported due to inherent limitations. The authors have provided an excellent review of the pros and cons of PSA, as well as the identification of new prognostic biomarkers for CaP, which can play an important role in the selection of treatment options. Drug resistance in cancers is a major challenge in cancer therapy. Shrikant Kukreti’s review outlines the current understanding of the factors and underlying mechanisms that enable cancer cells to resist anti-cancer drugs. Intrinsic and acquired resistance involve several mechanisms such as inactivation of drugs, drug efflux, alteration of drug targets, DNA damage repair, cell death inhibition, epithelial-mesenchymal transition, and the tumor microenvironment. The review describes the genetic and epigenetic factors that can induce drug resistance and contribute to the development of cancer progenitor cells, and resistance to conventional cancer therapies. The author provides an excellent overview of the understanding of the molecular basis and biomarkers of cancer resistance as well as diagnostic tools. The review highlights strategies to overcome drug resistance, and novel therapeutic approaches, thus providing a basis for developing effective treatments against drug-resistant cancers. Kaushik and Sahi have focused their review on recent anticancer drug discovery and development, based on modulating the signaling pathways through G-protein-coupled receptors (GPCRs). The CPGRs form the largest group of membrane receptors in eukaryotes and act as signaling molecules to inform cells about the presence or absence of life-sustaining light or nutrients, as well as signals from other cells in their environment. Post genomic understanding of these receptors has greatly influenced modern drug discovery, particularly in relation to anti-cancer drugs. In this review, the authors have provided a comprehensive overview of the current understanding of GPCRs, their role in disease processes, and approaches towards targeting these proteins for therapeutic purposes. The review contributed by Savic et al. focuses on the mechanism of actions of ribavirin (tribavirin), a broad spectrum antiviral medication. Ribavirin is among the oldest drugs used for the treatment of RSV infections, hepatitis C, and viral hemorrhagic fever. It is known to work equally well against both RNA and DNA viruses. Recently reported anti-cancer, anti-inflammatory, immunomodulatory, and immunosuppressive activities of this common drug have attracted major interest in its mechanisms of action, and in its use against various orphan and neglected diseases. Since the last four decades a lot of work has been done to elucidate the mechanism of action of ribavirin, but many questions remain unanswered. Savic et al. provide a systematic review of the literature on various sub-cellular, cellular, and enzymatic targets of ribavirn. In the next chapter Das and Sarma focus on the applications of carbon nanotubes in pharmacy and medicine. Carbon nanotubes have a large surface areas and the capacity to absorb or conjugate various classes of drugs effectively, and can thus serve as excellent drug carriers. They can also conjugate with genes, vaccines and antibodies for other applications in medicine. The authors review the most recent developments in this field and provide a critical analysis of the prospects of the use of carbon nanotubes as drug delivery vehicles. Other aspects such as phamaco- and toxico-kinetic parameters, and the functionalization and compatibility of carbon nanotubes to various classes of biopharmaceuticals are also presented. Tautomycin (TM), a natural product of bacterial origin, was identified as a highly specific inhibitor of protein phosphatase type 1 (PP1). PP1, along with protein phosphatase 2A (PP2A), is the major serine/threonine protein phosphatase. They are involved in the regulation of numerous cellular and biochemical functions. The roles of PP2A have been extensively studied using okadaic acid, which is a specific inhibitor of PP2A. Development of targeted inhibitors of PP1 has opened new avenues in drug discovery. Makoto Ubukata has reviewed the most recent literature on this topic, with special emphasis on neurological disorders in Minkowski space. The last review in this volume by Mokry and Mokra is focused on the importance of phosphodiesterases (PDEs) as targets for drug discovery against various respiratory diseases. Phosphodiesterases regulate the intracellular levels of cyclic nucleotide second messengers. The authors have discussed various key specific and non-specific inhibitors of PDEs, such as siguazodan, rolipram, sildenafil, aminophylline, roflumilast, etc. and their combinations, in the context of clinical use against various respiratory diseases, as well as their benefits and risks. We are most grateful to all the authors for the excellent contributions. We encourage readers to use the excellent materials presented here in developing their own research strategies, and as a vehicle for conversation with their peers. We are confident that this volume of the ebook series will receive wide appreciation from students, young researchers and established scientists. We would like to recognize the efforts of Mr. Omer Shafi (Assistant Manager Publications), Mr. Shehzad Naqvi (Senior Manager Publications) and the team leader Mr. Mahmood Alam (Director Publications) for putting together an excellent treatise of well written articles efficiently.